We have a special guest from Mauritius, Shaykh Sadeck Goolamhossen, who is a representative (Khalifa) of our Spiritual Head Shaykh Taner Ansari in Mauritius. He will be present at our Zikr on 14 and 21 September 2015, and as usual, our doors are open to everyone from all backgrounds who comes in peace. Zikr is free, and we welcome donations to help us with our rent of the venue. 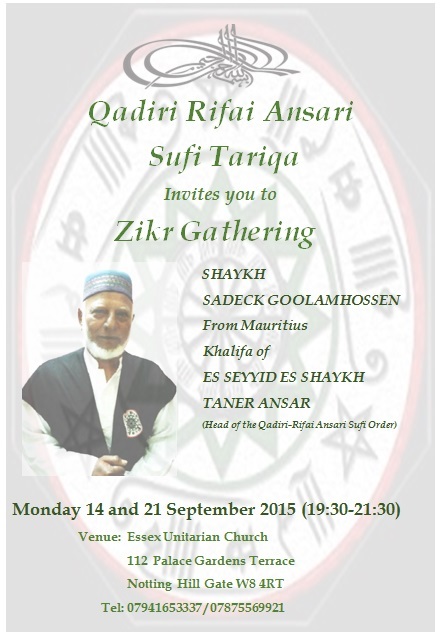 We look forward to seeing you at the Zikr.